We have a mailing list of people looking for the various Snuzzles Blankies animals. This Snuzzles lamb was my son’s first stuffed animal, and it went everywhere he went. When he learned how to talk he named it “Baby”. We were military and along the way with all our many moves somehow it was lost. He is all grown up now and has a 3 month old daughter. I have been searching for it, and I cannot find my son’s lamb. I am trying to find one to replace it, so that he can give it to his little girl, and she can have it as security for when her Daddy goes on deployment. My son is in the United States Navy. 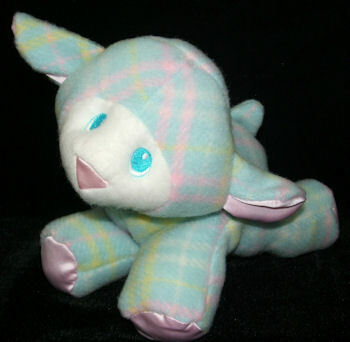 The lamb is a Playskool Plaid SNUZZLES LAMB, made with blue plaid fleece. Any help on finding one would be appreciated, and I do know that it will cost me to find one, but you know it is worth it to me for my son and granddaughter.